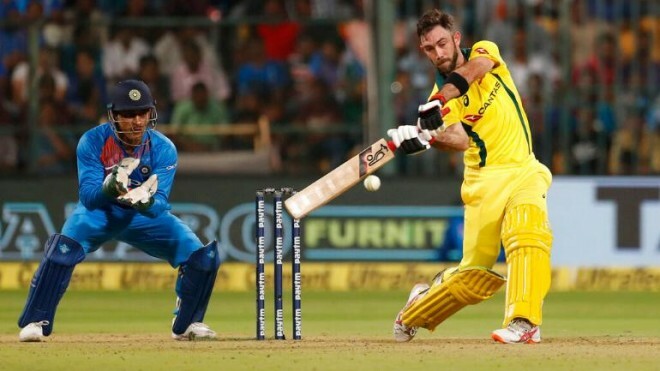 Bengaluru, Feb28: The blistering ton from Glenn Maxwell helped Australia to win the second and last T20 Match against India and also the series by 2-0. While Short found the boundary six times, it was Maxwell who brought out the fireworks. The proceedings started in the fifth over, when he top-edged a six off Jasprit Bumrah and did not spare any of India's other bowlers either. Consecutive sixes off Chahal in the 16th overtook the wind out of India's bowling attack, and when he drilled Bumrah for two fours in the 17th, victory looked imminent. With two overs to go and only 14 runs to win, Maxwell jammed a yorker down to the leg side to bring up his third T20I hundred. And with that milestone ticked off, he clubbed Siddarth Kaul for a six over long-off and then a flat-batted boundary to extra cover to bring up Australia's victory. But in came MS Dhoni, criticized in some corners for his 37-ball 29 in the first T20I. He struck his sixth ball, off wrist spinner Short, over midwicket before shellacking a boundary apiece over the next two overs. Balls that were short and wide were slapped over the infield, while anything on his toes was deposited to cow corner. In all, India's right-handers struck 175 runs in 15 overs. Their left-handers, Dhawan and Pant, made just 15 in five, and it's that discrepancy that may have cost India a series-leveling win on the evening.